No one wants to have one or more natural teeth removed from their smile, and that includes our dentists at Canal Side Family Dental. 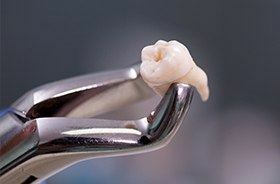 They will go out of their way to help you maintain strong, natural dental structure that stands the test of time – but sometimes, tooth extractions can become an unfortunate inevitability. We have plenty of experience with this type of advanced care and will ensure a smooth treatment process, arranging reconstructive care as needed to rebuild the lost tooth or teeth as soon as possible. Please contact us today in Buzzards Bay, MA if you have any concerns or would like to schedule an appointment. Why Choose Canal Side for Tooth Extractions? Should you ever need an extraction, we’ll use a gentle touch and plenty of local anesthetics to make sure you remain comfortable the entire time. And, if necessary, we can help you replace the tooth right away as well.